I decided to break out the flee market 2 man saw. Prepping the blade requires several steps assuming your blade is true. Here's how I spent a good part of a Sunday. Interesting seeing how that's done. Thanks for sharing that. A question for you: do you have the saw to use, or is it a interest/collector thing? I personally would think it would be cool to have one of those old saws and fool around with it and get it up and running like you did. I just don't think I'd ever use it practically, and was wondering if you were planning on doing so. I want to try to sharpen one pretty soon. Appreciate your post. Makes me want to give it a go. I picked up the saw at a flee market with the idea to get it functional but after I learned the process I put it on the list of things I never get to. My wife is away for work so I got to it. Anyway I'm far from an expert. I got a tip to try and us an adjustable wrench to bend the offset as it is easier on the blade or get a setting tool on ebay for 15 dollars. If you get a nice saw you will want a jointer/rake gauge and a setting tool maybe a spider gauge as well. This method is fine for an old saw. Oh yeah get all the teeth the same height if you can. Just a suggestion...Remove the rust deposits on your saw before you start any sharpening or tuning of it. It will be nicer to work with and will cut smoother when you are done cleaning it up. You can use wet & dry paper with a block or a large pumice block. You can get pumice blocks that are used to clean grill tops at a restaurant supply site. They work great and are rather inexpensive. These saws were cleaned up using a pumice block. Took about 30 minutes per saw. The homemade guards are lattice fence tops cut to size. You can get them at Home Depot or Lowe's in 8' lengths. How much would one of those set me back? Want to sell one? Wannabe, I've been collecting vintage logging hand tools for a long time. I've found some crosscut saws for as little as $10 and have paid up to $200+ for some really nice ones. Right now I have 35+ crosscuts. As far as one man crosscut saws go. I have 8 that I would consider as users. I've found them at yard sales, in a shoppers guide and on Ebay. I've also run a few want to buy ads. Most of the saws that one finds are in ruff condition, rusted and pitting. I consider those as wall hangers. Right now I want to hang on to my users. I would keep a watch on Ebay for a saw. That's where you'll currently find the most of them. Pristine saws go for big $. I would look for one that has surface rust, but not pitted, or with minor pitting. With some elbow grease these can be cleaned up rather nicely and turned into users. 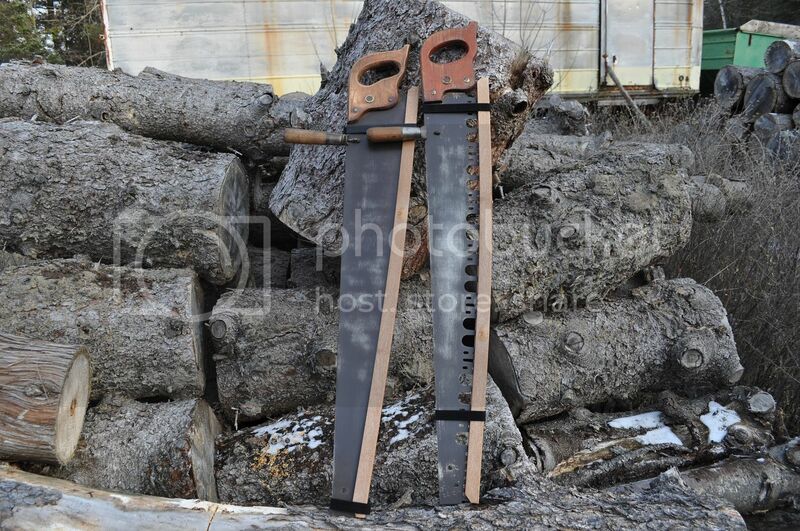 I have sent two of my saws to be sharpened professionally. They now cut like a dream. I have 4 more that I'm going to send off shortly to be sharpened. It's been a hobby for me. Wannabe, Her's an example of what I was talking about. It appears to be a saw made by one of the big three companies for either Wards or Sears. It is very similar to the ones that I posted above. It should clean up nicely..
Nice video. Do both sides of the rake need to be the same hight? Brain under construction please excuse my spelling! The cutters (pointed teeth) score the wood on each side of the kerf. The rakers (Yshaped teeth) remove the wood between the scores, in the middle of the kerf. The saw is meant to cut on both the push and the pull actions. So the short answer is yes, the rakers should be the same height on each side. Now the relationship between the height of the cutters in relation to the rakers height is another story. Simply, very simply, the cutters should be a little longer than the rakers. One could write a chapter about this topic, including setting the rakers height, swedging the rakers and filing them. Double O is correct. One reason I haven't undertaken sharpening one of mine yet is the complexity of this simple task. Saws are suppose to "sing" as they cut. I have what I consider to be a very good set of tools for fixing one but have still yet to endeavor to start filing on mine. I've been studying the process for a couple years now and am itching to try it. The premiss is simple. It's a relationship between.. in and out and up and down.. The cutters need to be all the same length and adjusted for the width of the kerf accordingly. The rackers need the proper height so as to cut away the material and remove it from the kerf. A properly tuned blade should pull long smooth curls as it cuts. I'm a fair mechanic and a lover of fine tools. I am a fair had at sharpening stuff but still need a little inspiration to start on a big one. I hear is mighty time consuming so I want to try and be prepared to spend my time wisely. I wish I lived closer I'd invite myself over for a lesson or two and buy you a drink or two for payment. LIke I said this saw has a little life left in her but not a prime example so its a great starter blade. I think I may need a one person saw and the jigs now. What's a good one man crosscut a guy can start with? New if possible. It's best to stick with vintage Wolfy. There are lots of good old saws out there. The setting and sharpening 'reconditioning kit' they sell for keeping it up is not cheap, either. My Ben Meadows & Forestry Suppliers catalogs make great "WISH books"! Cool as all get out though I got a bunch of tools I don't know how to use...yet! Have you ever been out to the 9 mile Ranger Station? Is that west of Helena? No Wolfy, it's west of Missoula. It's where most of those booklets are done. It's the MTDC: Missoula Tehnology Development Center that distributes them. That's out by the smokejumpers center on west Broadway. The Nine Mile Ranger District and station is an old FS historical site. I SAID Helena, but I MEANT Missoula! Yeah, I have.....was with my folks to see where the smokejumpers base is, but have never been to the place you're talking about. You mean there's something I MISSED? I'm not an expert on crosscut saws. But I've been collecting them for years. I do use some and I've been studying them for a long time. I do spent a fair amount of time on the Crosscut Sawyers forum. These guys are true users, avid collectors and saw fillers. Most of them really are knowledgeable. They will not endorse any of the currently made saws. They do support the vintage saws that were the only means to buck wood or fell a tree, using a saw before the chainsaw came along. One should really do some homework before they just buy a saw. One has to know when a saw has been mistreated or over used and filed down to be in poor condition. The different tooth patterns are designed for cutting different types of wood. Most of the saws one finds are bucking saws, for cutting up felled trees. But there are felling saws (like the one Yukon12G posted) that are usually not suited for bucking...They are usually to light and thin for this task. There's lots to learn and it takes some time. I guess, if one was going to buy his first chainsaw, most of us would invest some time in researching them before one would just run out and buy one. The same applies to a crosscut saw. Stay away from he new ones, it will be a poor experience for you and you'll be disappointed. Surprise... most of these new saws don't even come sharp from the factory and have to be sharpened and tuned up before they will cut very well. I guess that's why I invested my frogskins in a Stihl. I bought an old 42" in good shape. It is a project I want to start when I have time to research the way to sharpen and money for the tools. Thanks you guys for you thoughts on this subject. Nice collection of setting tools and are the other gauges jointers and rakers? OH yeah.. Stihl please 271 if you can spare the change. Mind you if I got a husky I could get a matching rifle in 6.5mm Compelling arguement. Nice piece, Yukon! I'd get a matching saw for mine, too, but as far as I know Carl Gustaf never made any.